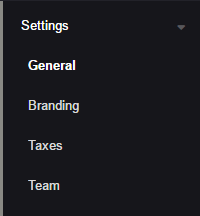 A quick overview of General Settings, Branding, Taxes, and Team settings. Settings is where you can update your company info, invoicing, proposal, logo, payment and tax settings and add new users. It's important to go through these before you get started to make sure that everything will work smoothly. This is where you can edit your basic company info, invoicing and proposal settings. Company Name - The name you enter in Company Name is what will be used in all proposals, engagement letters and email correspondence sent to your clients through Practice Ignition. Company Email - this is the default email address used to communicate with your clients. We recommend using a generic email address, e.g. [email protected], instead of personal emails to avoid delays due to holidays etc. Country - It is important to complete this correctly as it determines the currency used in your proposals. Timezone - This field is important to set as it will ensure your dates are correct on your proposals and engagement letters. Start of Financial Year - This is the financial year of your practice. It can be used in engagement letter templates, and it also determines the financial year displayed on your Revenue Dashboard. Recurring Invoice Day - This is the day of the month that your recurring monthly invoices are raised and sent across to your accounting system. Sometimes you may have a client that you need to invoice on a different day of the month, or you'd just like invoice clients on different days in order to smooth out your cashflow. 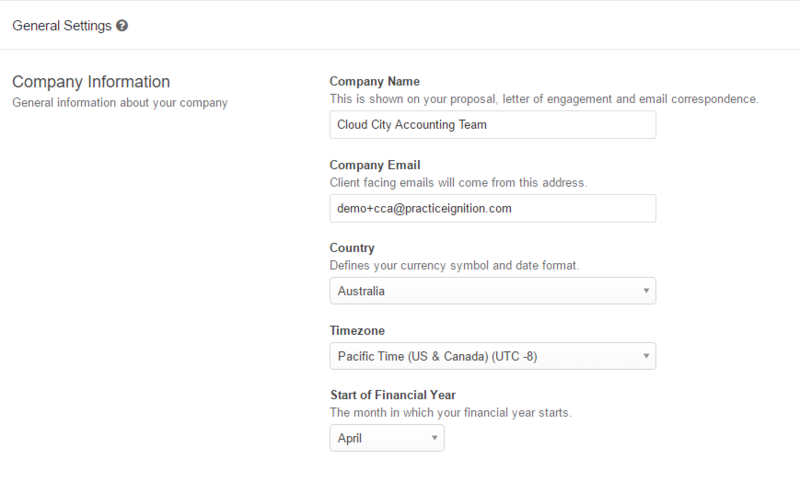 To help with this, Practice Ignition lets you choose a custom recurring invoice day for specific proposals when you create them. Recurring Weekly Invoice Day - This is the day of the week that your recurring weekly invoices are raised and are also sent to your accounting system. Default Pro-rata - This will ensure pro-rata is enabled by default for recurring services. Note: We recommend you have this switched on, as you can always override it on a Proposal level if necessary.This will ensure your invoices will get created even if a proposal is accepted after the engagement start date. For more information on how Pro-rata works, please read this article. Default Proposal Start Date - This is the default day of the year that all new proposals will start on. You can change this within each proposal as you create them. Acceptance Email Notification - A copy of the acceptance email will be sent to the email addresses(es) you input here. This is handy if you wish to be notified whenever a proposal is accepted. Total Value - You can choose to only show the totals of each billing type rather then the total value of the engagement. For instance if you have a 12 month engagement with a monthly recurring service for $100, rather than showing a total value of $1200, it will just show the monthly cost of $100. You can override this default setting on a proposal level. PDF Page Size - If you intend on printing or saving the PDF versions of your engagement letter, please select your page size standard - for North American users, you may want to change this to Letter or Legal. Make sure you click the Update Settings button at the top-right corner before moving to the next screen to save any changes you've made. Client Notifications - When a new invoice is created or paid, you can choose to automatically send an email notification to the client. Click here to read more about the Client Notifications feature. Under Settings on the left-hand menu, click on Branding. This is where you can upload your logo and change your branding color. Your company logo and primary branding color are used on the emails sent from Practice Ignition and the Client Acceptance Page. You can drag and drop your logo over the web connector preview, or click the Choose File button to select one from your local files. 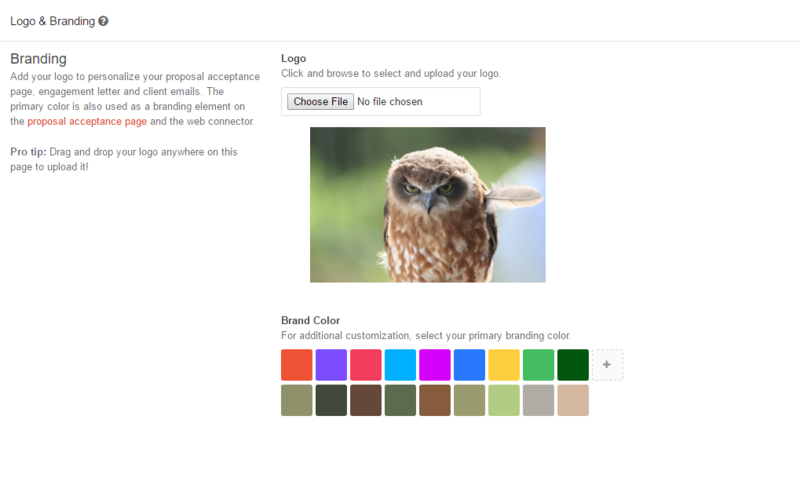 Once uploaded, the system will automatically detect the colour palette of your logo. Choose a colour that you wish to use for your proposals and for your web connector. You can also use a custom color by entering a custom HEX color value by clicking on the plus button at the end of the colour palette and typing the HEX value of the color in the field below. The sales tax module allows you to specify default tax rates for services, provides options in how you present proposal prices. Setting up your tax rates will make sure your connected invoicing systems will have the correct tax rates populated when Practice Ignition generates an invoice. Note: Taxes can only be enabled if you have an accounting app connected. Tax rates are imported from your accounting app - If you need to edit your tax rates, it needs to be done in your accounting app and then synced with Practice Ignition. Read more about configuring tax rates here. Next is the Team - Under Settings on the left-hand menu, click on Team. Our recommendation is to set up everyone in your practice as a user in PI. You can restrict access by applying different user privileges. Read more about users and user settings here.